Thank the Lord with us for our first meeting in Berekfürdő, where we are establishing a mission point and praying for a church plant in partnership with Pastor Csaba Pesti of Karcag. We are still looking for a permanent place for the Berekfürdő group to meet, but for now the Catholic priest–who is a friend of Pastor Csaba–is kindly allowing us to use a room belonging to his church. Only five of us were present at the July 7 gathering, but it was wonderful to actually be on site in the town for a time of worship, Bible study and prayer. 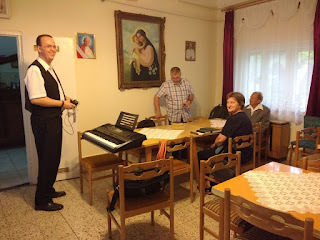 At this point we will be meeting in the town every other week, with alternating Fridays spent in discipleship/evangelism training at the mother church in Karcag. 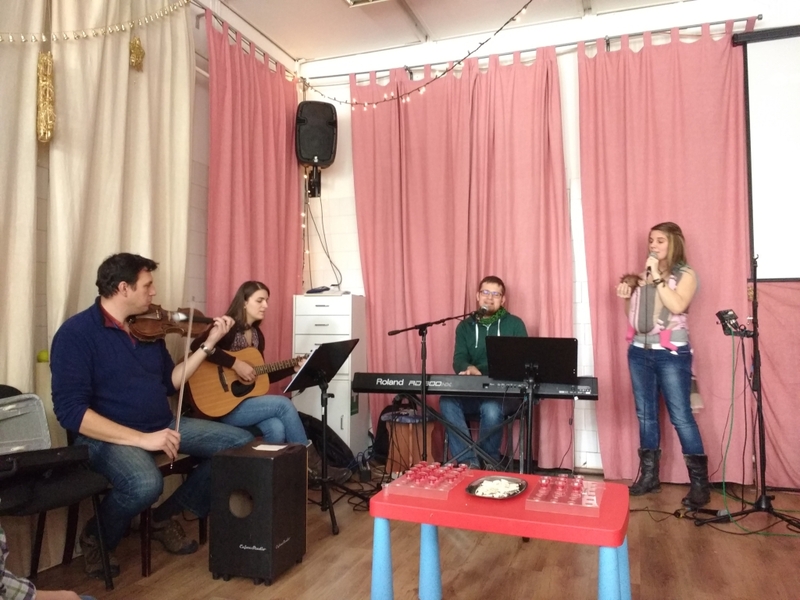 Continue to pray for Berekfürdő, asking that new connections will form, people will come to Christ, and that a vibrant, reproducing church will be planted. Small group after the meeting. The courtyard has a very lovely, peaceful garden. On January 29th I had the joy of visiting a small, family-style church in Békásmegyer. This area of Budapest was actually an independent village until 1950, when it became a part of the capital city. Here’s how my visit came about…. Gary and I had spent Friday and Saturday taking part in the Grain Game Hungary conference in Érd, after which Gary left with our friend Chip Riley (Grain Game founder) for a trip into Serbia for some meetings. I didn’t want to go back home to Debrecen on the late train, preferring to make the trip during daylight hours on Sunday (train stations are not always a good place to be at night for a woman alone.) Our wonderful co-workers, the Baker family, graciously let me stay in their home that night. 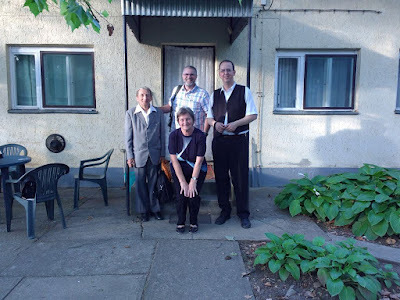 The next morning they took me along to the church they have been attending, the Békási Golgota church. They were having a special service which included a lot of time for prayer and quiet contemplation, worship, and the observance of the Lord’s Supper. I returned home on the train that afternoon filled with the joy of His presence and the blessing of time spent with brothers and sisters in Christ. Praise the Lord for times of refreshment and fellowship! Please pray for this church as they worship and grow; ask that the Lord will guide them in reaching out to the many, many lost people in their community. Pray for our co-workers, the Bakers, that God will give them wisdom in how to best partner with national believers in the awesome task of making Him known among the nations. Continue to pray for the ministry of The Grain Game. They are currently beginning a new emphasis on starting new ongoing groups of young people – particularly those who are unchurched but spiritually open. We pray that these groups will grow into church plants. This morning we headed to Balmazújváros, where we attended a weekly gathering led by Pastor Csaba Karancsi. There was Scripture reading, discussion, and several testimonies of changed lives. The atmosphere was of love and caring, no matter the place in life. Pray for those at the gathering who are seekers, that they will continue to learn more and will soon give their hearts totally to Christ. When we told the group that people around the world are praying for them and Balmazújváros, they said “thank you” on behalf of their city. After the gathering we stayed for a meeting with the pastor and other leaders. We discussed working together in an outreach planned for March. Praise the Lord that things are moving forward! Pray that God will guide and be glorified as plans come together for further ministry. Sunday morning we had the great joy of visiting a church plant in the town of Balmazújváros. This is a town that we have had on our hearts for many years; we have done projects there, had concerts, spent time prayerwalking and talking with the people. At one point we thought we were about to see a church plant begin, but then a key family that we were working with in the town moved out of the country. So praise the Lord, it was awesome to see that God is working in new ways there, and a small group is regularly meeting. 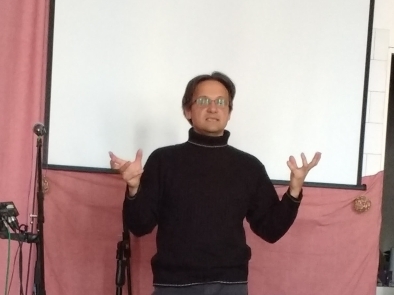 Pastor Csaba Karancsi of the Újfehértó Baptist church is the supervising pastor, and a national believer is leading the Bible study each week. As we saw Sunday, the group is quite serious about studying the Word and in desiring to reach out to their community. Pray for this group, that they will continue to grow and give God glory as they live as salt and light in their town. Also pray for us and Pastor Csaba as we meet this week to discuss how we may partner together for further outreach in this town. Join us in praying, using the Balmazújváros virtual prayerwalk that we made several years ago. Now I want to make a revised version showing what God has been doing since that time!